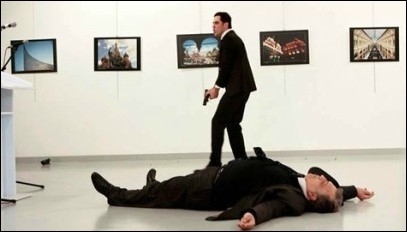 Russia's ambassador to Turkey was assassinated on camera at a photo exhibition on December 19. As if the recent acts of terrorism by Islamic militants coinciding with Prophet Muhammad's birthday was not enough, radical Muslims have struck again, with a vengeance. On Monday, Russia's ambassador to Turkey, Andrei Karlov, 62, was shot dead in cold blood by a Turkish police officer acting in solidarity with the defeated Arab jihadis of ISIS and al-Qaida in the Syrian city of Aleppo. Mevlut Mert Altintas, 22, entered the gallery by showing his police badge, then stood calmly behind Karlov before drawing his pistol and firing nine shots, yelling "Allah O Akbar!" as the diplomat fell to the ground. The Turkish assassin was then heard chanting the unofficial anthem of al-Nusra, the Syrian branch of al-Qaida. "We are the descendants of those who supported the Prophet Muhammad for jihad." Switching to his native Turkish, Altintas added: "Don't forget about Aleppo. Don't forget about Syria. As long as our lands are not safe, you will not taste safety." Before he was shot dead, the killer reportedly said: "We made an oath to die in martyrdom ... it is revenge for Syria and Aleppo ... until they are safe, you will not taste safety." Here was a Turkish terrorist, in solidarity with Arabs, revealing a common attribute of jihadis -- loyalty to the Islamic umma, not to their country of birth. If this act of terror was despicable, the reaction of the Islamist Turkish government provides insight into the dishonesty that has become the hallmark of those Muslims who use Islamism as a political tool around the world. Despite the assassin's self-professed loyalty to the Syrian jihadis, Turkish security officials immediately claimed there were "very strong signs" Altintas was a follower of a Muslim cleric currently exiled in Pennsylvania. The assassination in Ankara won't end in the global war that followed the assassination in Sarajevo almost a hundred years ago of Archduke Franz Ferdinand of Austria. But it is eerily similar to the assassination of Pakistani governor Salman Taseer by his jihadi police bodyguard in January 2011. This act of terror should serve as a reminder to all of us that Islamism has declared a war on civilization, one that cannot be fought as we did in the First and Second World Wars. Today's war requires the traditional attribute of courage, but also the honesty to denounce the political correctness rampant in our societies that allows our enemies to operate inside our borders, and our neighbourhoods, with invisibility. It requires an admission we have wasted 15 years enriching NGOs and the military-industrial complex, while playing second fiddle to Turkey, Saudi Arabia and Qatar. 1. In Berlin, a truck driver killed 12 Christmas shoppers. 2. In Zurich, gunfire at a mosque injured three people. 4. In Afghanistan, the Taliban killed a woman for re-marrying after she divorced her husband. 5. In Jordan, 10 people including Canadian tourist Linda Vatcher died in an ISIS attack. Yet Prime Minister Justin Trudeau and NDP Leader Thomas Mulcair, among many other parliamentarians, firmly believe the real problem is Islamophobia, not the global terror let loose in the name of Islamism.